Woodside was a castle on the eastern edge of the Tor Wood but it was demolished in the mid-19th century and replaced by the mansion of Glenbervie House. 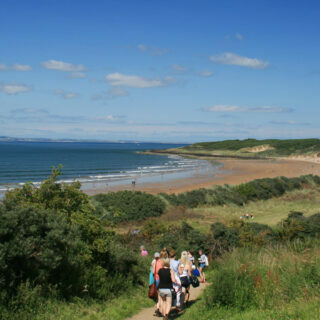 The exact early history of Woodside is unclear, however the first castle may have been built by the Bruce family in the late 15th century or in the 16th century. The estate of Woodside latterly included the lands of Lethbertschiells, or Lethbertscheilles, and Stanrigmill, and the history of Lethbertschiells goes back further than that of Woodside. In the 14th century, during the reign of David II, Lethbertschiells was owned by Adam Salter and later by a William Lundie. Lundie forfeited the estate and it came into the possession of Adam de Argent prior to 1369, but in 1377 he resigned the lands in favour of Robert Stewart, the second son of Robert II and later Duke of Albany. 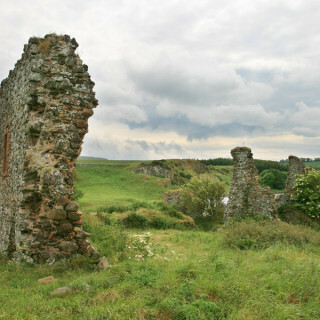 There is a charter of Lethbertschiells to Alexander Bruce of Stanehouse in 1451 and the lands passed first to his son, Sir John Bruce of Stenhouse and Airth, then to his grandson, Thomas Bruce, who was known as the first of Lethbertschiells and Woodside. This seems to be the first mention of Woodside distinct from Lethbertschiells and may indicate that the first building was constructed at this time. 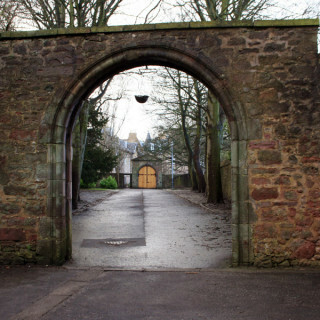 What form it took is unclear however the east and north wings of the nearby Airth Castle were built by the Bruces during the 16th century and may give a clue as to the appearance of Woodside. 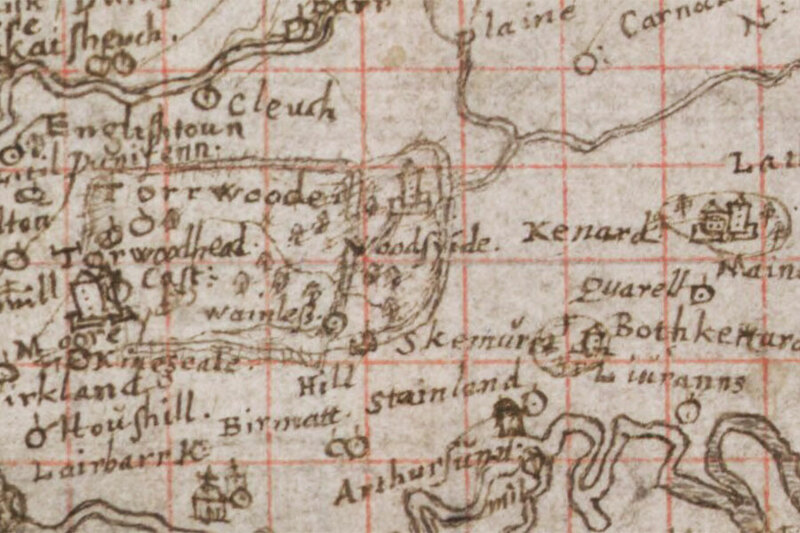 It is marked on Pont’s late 16th century map as a tower named Woodsyide. Thomas Bruce was involved in a conflict with his neighbour Alexander Forrester of Torwood which seemed to continue down the generations of each family as Thomas’ grandson, Robert Bruce, was murdered by Robert and James Forrester, sons of Thomas Forrester of Myathill. Robert’s son, another Thomas, was retoured heir to his father in 1603 and married Elizabeth Rollock. 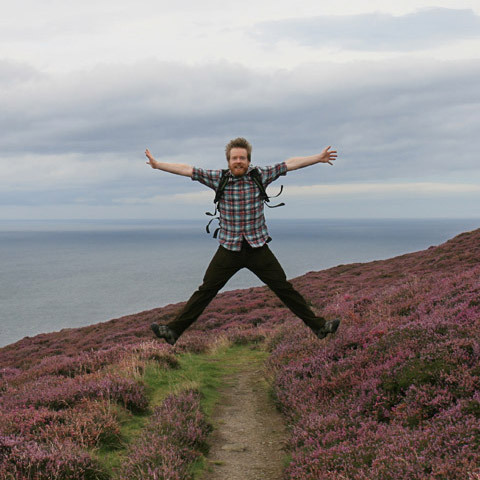 In 1629 the lands of Woodside were covered by a bog which was dislodged during a violet winter storm from what is now Letham Moss. Thomas Bruce, the fourth laird of Lethbertschiells and Woodside, sold the lands of Woodside, Lethbertschiells and Stanrigmill to Dame Helen Elphinstone, the fourth daughter of Alexander, 4th Lord Elphinstone, who had a charter of them in 1636. Dame Helen had previously been married to Sir William Cockburn of Langton and following his death to Henry Rollo or Rollok. Whether or not Henry was related to Thomas’ wife Elizabeth I have yet to ascertain. 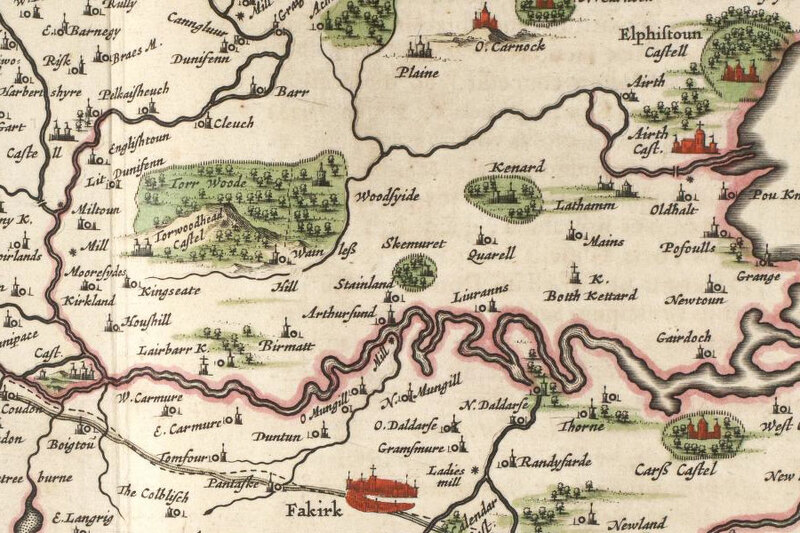 Woodside then passed to John Rollo, the son of Dame Helen and Henry Rollo, upon his father’s death in 1649, and is marked on Blaeu’s map of 1654 as the tower of Woodsyide. Following John’s death in 1674 Woodside passed to his son, Henry, who was a Supervisor of the Salt Duty, married Margaret Young whose parents are thought to have been Sir John Young of Leny and Mary, daughter of Sir Thomas Hope of Kerse. This Henry Rollo evidently carried out some work on his property as the date 1692 and his initials intertwined with those of his wife, HR and MY, were to be found carved on a two storey building which stood to the south of the main castle. The ruins of this building were described in the early 20th century as not having the appearance of being a defensive building, with walls around 0.6m (2 feet) thick. It measured around 16.5m east to west by around 6.1m north to south (54 feet by 20 feet) and consisted of two storeys with crow-stepped gables at the east and west ends. The building was described as being plain despite a moulded cornice just below roof level. There seem to have been two rooms on the ground floor, each accessed via a separate doorway on the south side, and two rooms on the first floor above. Carved into the lintel above the west door was the aforementioned date of 1692. 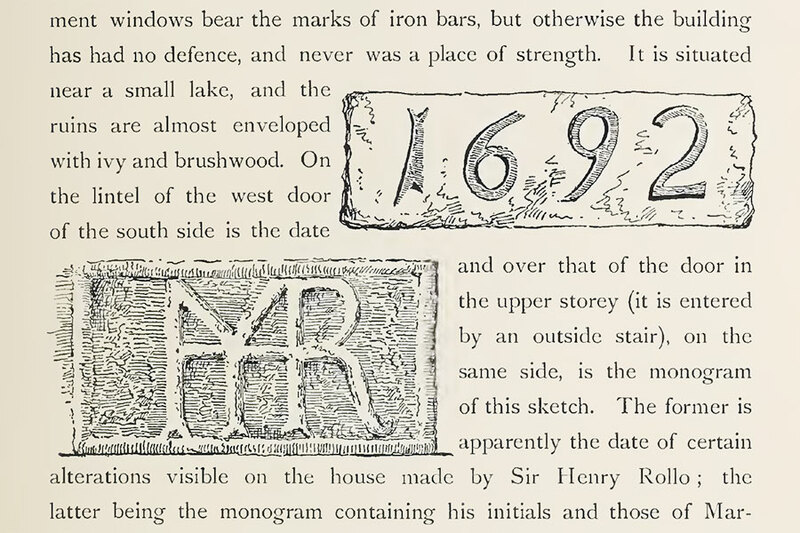 The monogrammed stone was carved over a door on the first floor which was accessed via an external staircase. At the east end of the ground floor was a wide-arched fireplace which took up the entire width of the building. Given the size of the fireplace and the lack of defensive features I believe that this building was originally a kitchen wing added, possibly in the early 17th century, to the south side of an earlier castle which was probably built by the Bruces during the 16th century. Henry Rollo then perhaps remodelled the kitchen wing in 1692. Just 18 years later Henry, by now Sir Henry, built a new mansion, Woodside House, seemingly on the site of the old castle and connected to the 17th century wing. Whether any fabric of the old castle was incorporated into the new house is not recorded, however a sketch of the new building seems to show a large rectangular three storey crow-stepped main block with two wings projecting west and surmounted by ogee roofs and a grand entrance between them. 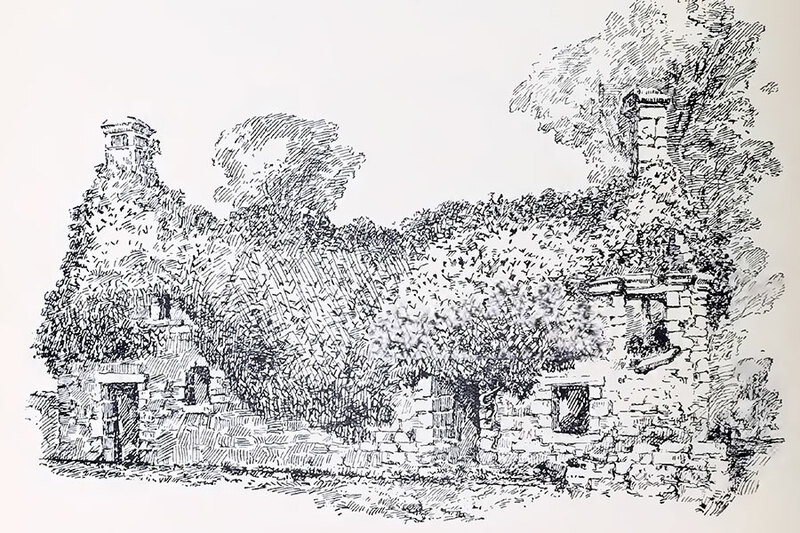 Although the sketch isn’t particularly detailed it perhaps gives a hint that the main block had 17th century origins and was extended and remodelled by Sir Henry in 1710. 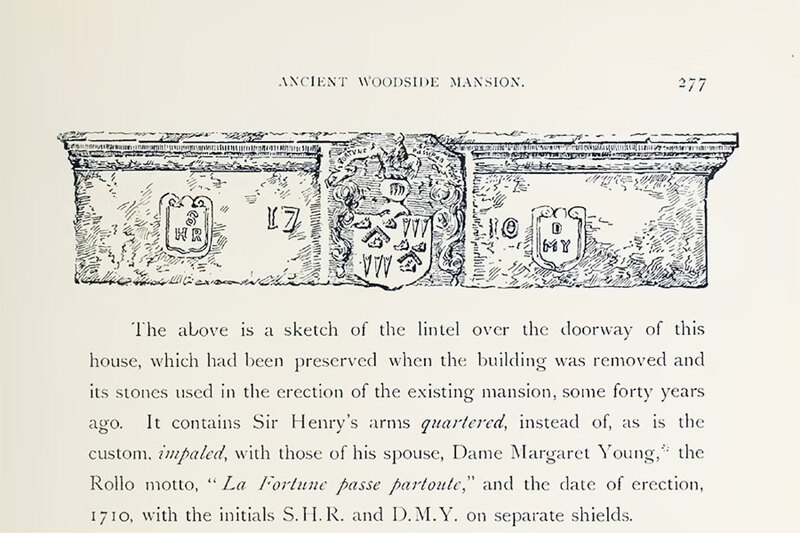 An elaborately-carved lintel was installed over the main doorway and features the quartered arms of Sir Henry and his wife, the Rollo motto “La Fortune passe partout” (“Fortune in all things”), the date 1710 and two shields containing the initials SHR and DMY for Sir Henry Rollo and Dame Margaret Young. 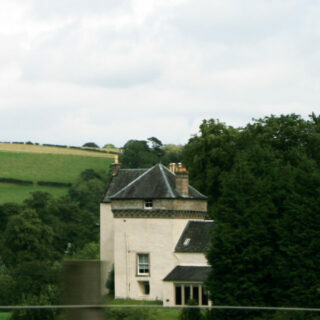 In the same year Sir Henry added several acres to estate, acquired from his neighbour Lord George Forrester of Torwoodheid. 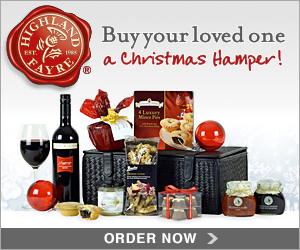 But in 1724 they sold the estate to Sir George Dunbar of Mochrum, whose wife Janet was Dame Margaret’s sister. Sir George renamed Woodside to Dunbar House and also added to the size of the estate during his tenure. Following Sir George’s death his trustees sold the estate to John Strachen or Strachan of Thornton in 1782 who also added land to the estate which he reverted to calling Woodside. In 1801 Strachan sold the estate to David Russell, a partner in the firm Stirling, Gordon & Co. in Glasgow, who also expanded the estate but who died in 1808. 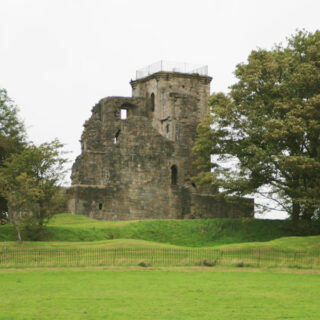 Russell’s eldest son, Colonel James Russell of the Stirlingshire Militia, inherited the estate upon his father’s death. The Colonel died in 1830 and was succeeded by his eldest son, Lieutenant David Russell of the 9th Regiment of Hussars but his father’s trustees sold Woodside to his uncle, Sylvester Douglas Stirling, in 1832. Stirling renamed Woodside as Glenbervie in recognition of his descent from Sir Archibald Douglas of Glenbervie in Kincardineshire. 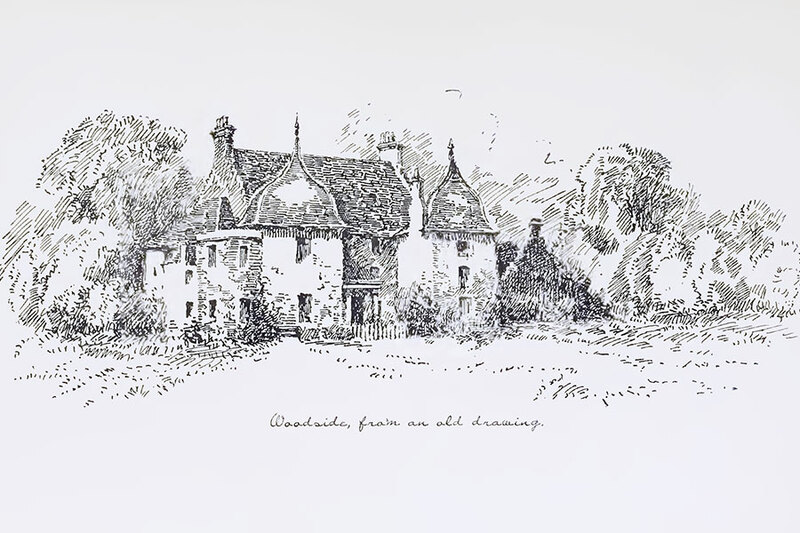 In 1846 Stirling drowned and around 1850 his wife, Anne, demolished the old house and built the new mansion of Glenbervie House around “600 yards to the south” of its predecessor, preserving only the entrance lintel. 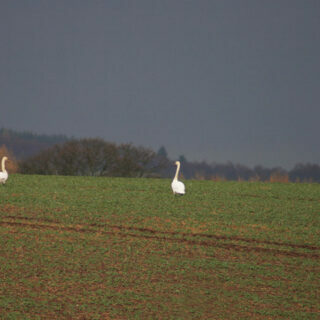 This would place the site of the old house somewhere around the south side of the eastern edge of Wallacebank Wood. It’s possible that the distance was overestimated and that the old house was actually located where a later coach house was built, around 200m to the north of the present house. Mrs Stirling died at Glenbervie in 1899 and her trustees sold the estate to James Aitken of Darroch in 1901, of the law firm Russel & Aitken. His sister, Janet (Jessie) Aitken, took over Glenbervie following his death in 1911 and she owned it until her death in 1923. 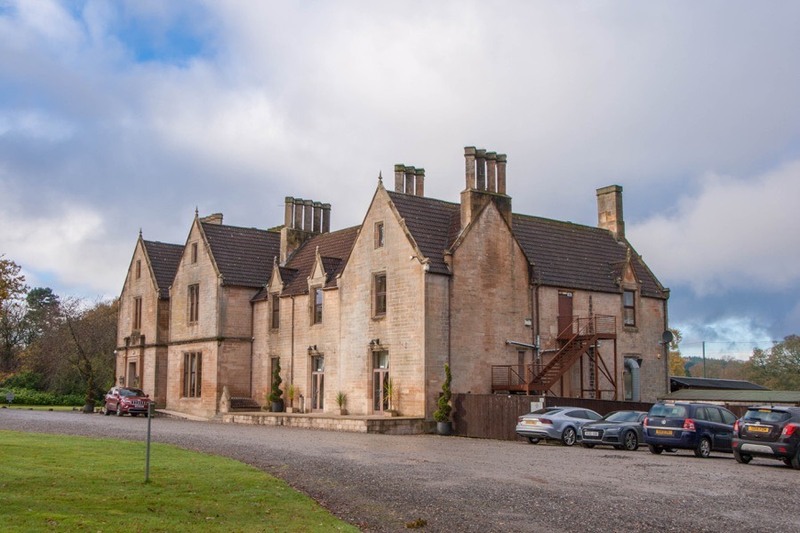 In 2006 the house was bought by the company that operates Airth Castle Hotel and opened as the Glenbervie House Hotel in 2007. Woodside is in the parish of Larbert and the county of Stirlingshire. Published on the 28th of January 2012 at 12:51 pm. Updated on the 31st of March 2019 at 4:46 pm.